After the Saints’ home loss to the Chiefs in overtime, the City of New Orleans almost shut down the Mississippi River Bridge and all other elevated bridges in the parish, out of concern that too many fans would jump. All point bulletins on police radios reported numerous sightings of citizens in black and gold garb wandering the streets, babbling incoherently. The State of Louisiana wondered if they should open an additional crisis phone line for mental health assistance. The number to reactivate was 1-800-BAD-TEAM, in deference to the late media eccentric, Buddy Diliberto. Record Shakers Regardless of the circumstances, the Saints do like to toy with records. When the Chief running back took the left lane of the interstate for 91 yards and a touchdown to commence an 18 point rally, it set a Kansas City mark for longest run from scrimmage in half a century of pro football. The Saints have thus far surrendered just under 500 yards a game to opponents, joining just two other outfits for most real estate given up since 1951. On an average of, say, 25 teams in the league over that time span, that’s being in the bottom 3 of 1,500 teams. Fifteen Hundred Teams! Dark Side One Saints fan relayed she left the game Sunday when overtime began, because she knew what would happen. We doubt she was the only one. Indeed, series by series, point by point, minute by minute, as the visitors caught up and won, excruciatingly, the Superdome emanated inexorable negative force of the kind reserved for the franchise’s darkest moments. The hopeless feeling wasn’t foreign to long time fans of the team, but one that hasn’t visited in a long while. Drew Brees was helpless to do anything about it. His body language has resembled a male version of postpartum depression syndrome, something Sean Payton would no doubt get on him about if he were here. The Boys Of October Nails were heard being tapped on, the team in red was the hammer, and the coffin was quite likely being shut for what’s left of the Saints 2012 season. At this point, harping on the variety of reasons as to why feels moot. It’s only 3 games out of 16, but given the remaining competition and the math in the standings, the Saints are on the verge of irrelevance for the year. And it isn’t even October. Be Like Tim As part of the game plan, for the losers of 3 straight, to teams that haven’t beaten anybody else in the league, all the seats in the Saints’ charter plane to Green Bay should be removed, so that staff and players can spend the entire flight bent over on their knees with fists implanted on foreheads, Tbowing. They’ll need all that and more to stay within 20 points of the Packers, who won’t be caught napping after being robbed by the refs in Seattle on Monday night. Unveil The ”29” Saints’ coaches should throw the playbook out the window for Sunday afternoon’s game, because, let’s face it, the percentages are stacked against them anyway. For example, no more than 2 or 3 defenders should be rushing Aaron Rodgers on any given pass because the Saints aren’t likely to get a meaningful rush on him, regardless. All the extra free seconds in the pocket, oddly, may momentarily throw off his timing. A “29” pass rush leaves 9 Saints to cover 5 Packers. Yes, make Rodgers throw lots of Hail Marys. Seriously. Even if in vain, we prefer that match-up to the Chinese Fire Drill on defense that what we have been witnessing all September. If they run the ball down the field against that gift of a formation, at least it adds up to more time off the clock, which is the Saints’ greatest weapon in this contest. We don’t like 3 in 1,500 odds to conventionally try and stop Green Bay. Run Baby Run, In The Name Of Vince And on offense, all Saints ball carriers should avoid out of bounds unless absolutely necessary. The backs should slide rather than stop the clock. Receivers should not step out of bounds unless it is their last possession of the half. If and when they fall behind by double digits, the Saints should remain stubbornly committed to the run, if only to keep the clock moving. Why be in a hurry to score if doing so just gives the Packers another turn to pad a lead? If the Saints can somehow turn this game into something of an offbeat farce, that’s their best shot at winning it. Seriously. One Saints fan suggested the late Vince Lomabardi’s grandson, who is an assistant with the team, be appointed as yet another interim head coach, if only for the week, so as to perhaps symbolically spook or jinx Lambeau Field. This idea was not preposterous. Sequel? It is disconcerting, sad really, that the Saints’ drop from competitive grace has been so swift, by the core of a team that won 13 regular games last season, and was only a last minute of a defensive breakdown away in San Francisco from being good enough to win its second championship in three years. 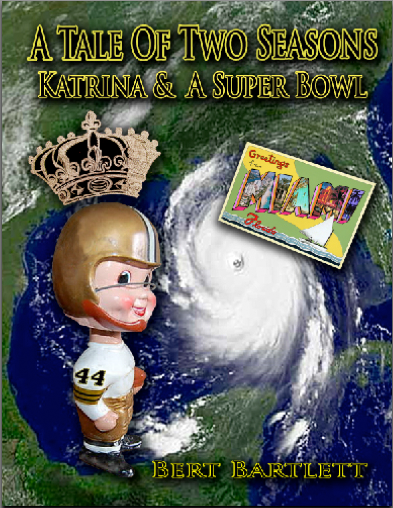 One is wondering if there is enough compelling material for a sequel to the book A Tale Of Two Seasons, Katrina & A Super Bowl, one titled A Season That Never Was. We’ll ascribe it to the franchise’s historical flair for the dramatic. Oh Are Ye Faithful? En masse, Who ‘Dat Nation has always subsisted on its own unique brand of steadfast faith.This game will particularly illuminate which fans within those confines are pretenders or contenders. Plenty of Post-Katrina Johnny Come Latelys have already put their jerseys in the closet till next fall, and are researching Hornets tickets. Speaking of historical flair for the dramatic, sadly, Ed Sabol of NFL Films passed away from brain cancer at age 69 last week. Ed played football and studied art in college, and his firm founding father thus told him he was “uniquely qualified” to come and work for the little company, which started on a whim and a shoestring. The NFL was lucky it did. When the use of television exploded in the 1960’s, no entity than NFL Films did more to introduce and promote the quality of the pro game. Their 30 minute syndicated highlight shows, voiced by the legendary baritone of the late John Facenda, made kids miss their bedtime to watch them, and their artistic quality was such that the royally bred intelligentsia in the population could not dismiss them as just another example of sports fodder. Facenda’s tone was the shows’ trademark, and he often came across as if he were delivered for this purpose directly from God. Memorably, Sabol’s father broke un-chartered ground when he convinced the late Kansas City head coach, Hank Stram, to put a concealed microphone in his clothing for a feature piece while on the sidelines when his Chiefs played Minnesota in Super Bowl IIII here in New Orleans, in January of 1970. Stram had lots on his mind at the time, his team a big underdog, and his quarterback Len Dawson received unwanted last minute innuendo and lots of negative press about an unsavory gambling association, which was quickly proven to be untrue (the guy’s last name was also Dawson and that was about the extent of it). Stram consented, relaxed after being assured by Ed Sabol, Sr. that he would be reserved some pre-release editing rights. Not only did the Chiefs win big, but so did the piece. The nattily attired Stram was entertainingly filmed walking the sidelines, cajoling his team to victory. 64 Toss Power Trap! Keep Matriculatin’ Down The Field Boys! In that day and age, Stram welcoming the viewing public into the sideline game machinations was silently resented by the coaching fraternity as well as much of the sports media, as if he spilled some beans on top secrets at the Pentagon. The resentment was absurd, as putting a lid on freedom of expression is usually a bad idea. This lasted for years, and contributed to Stram’s relatively late but much deserved enshrinement into the Pro Football Hall Of Fame. As time has passed, Sabol, Sr. and Stram were proven right to invite, and those who didn’t like it were left with nothing but envy. Young Sabol said he viewed pro ball as a mix of myth and art, and his work reflected this. He carried on a frontier tradition with NFL Films, forever experimenting with limitless camera angles, sound bytes from the sidelines, and trajectories over the field, with music (early on, the tunes sounded like a nostalgic mix of symphony and Broadway, with lots of brass), that stuck chords of cross generational American Pop. Today, highlights on all the channels have become more canned and homogenized, like much of the game itself. Sure, at the time, we knew Sabol’s pigskin Greek Tragedies could overflow with drama, but forgave any shortcomings, because of the virtues of his intent. Granted, those were the days when the game was played outside on real grass, uniforms actually got dirty, and when a player sat on a bench exhausted with a bloody nose, no one rushed to attend it wearing rubber gloves to avoid an Aids infection. But like, say, the movie Jaws, we simply liked it. Sabol’s passing is the formal punctuation mark to an era long gone, particularly the Sixties and Seventies, when NFL Films and the league it angled complemented themselves to compose lighting in a bottle.